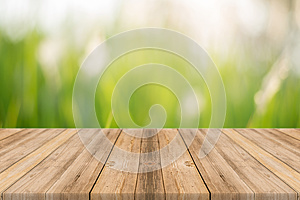 Photo title: Wooden board empty table blur trees in forest background. Wooden board empty table in front of blurred background. Perspective brown wood over blur trees in forest - can be used for display or montage your products. spring season. vintage filtered image.